Black Bear Auto Offers Auto Repair Services You Can Count On! Black Bear Auto has been providing customers in the Bristol, CT 06010 area with high-quality automotive maintenance and repair services since 1998. Our experienced mechanics will get your vehicle up and running again, and we'll keep it in top operating condition. We provide a range of services, including General Services, Car & Truck Care, Customs and Classics, Undercar Services, Alignment, Brakes, Tires, Engine & Transmission, Engine Maintenance, Transmission Services, 4x4 Services, Heating and Cooling Services, Electrical Services, Electronic Services, Miscellaneous Services, Domestic Cars & Trucks, Import Cars & Trucks and Towing. We're proud of our great mechanics, who have years of experience working on many different types of vehicles. They have the knowledge required to diagnose your problems, and to find affordable solutions to get you back on the road quickly. To learn more about our services, call us at 860-585-1111 or email us today. We're looking forward to earning your trust as a friendly, honest and reliable alternative for your auto maintenance and repair needs in Bristol. We love Black Bear! We have been having our cars serviced by them for 18 years. They are always fast to get you in and always gets the cars serviced or repaired quickly. They are friendly and really personable and they really know what they're doing. Because we are so confident in them, our children have grown and have taken their cars to Bear as well. And now that our grand daughter is driving, she also takes her car to Black Bear. I highly recommend! After 18 years Barry is more than our mechanic, he's our friend. I love having these guys just around the corner. Thay are quick, courteous, and more than professional. I have gone to them for just about any job I could think of and they always walk me through it. The information they provide is clear and easy to understand, especially when you know nothing about cars. I reccomend them to everyone I know. They completed a very complex set of work on my truck: -Engine replacement, including several new accessories. -Exhaust pipe repair. -Plow accessory repair. My Dodge Ram V10 can be a tough one to find parts for but they did not fail to find and install everything it needed. They juggled scheduling (mine/theirs) to get everything done before holiday break. They would not say the job was complete until all details were sorted out. In the Bristol area, this is the right shop to do business with. This is my 1st time at Black Bear for brakes. Barry made it an awesome experience. Fast and great customer service at a reasonable price. I would definately recommend them to my friends and family. I went to Black Bear Auto today thinking I had a major problem. I was leaking transmission fluid. The folks at Black Bear Auto immediately fit me in their schedule. I quickly learned I just had a worn plug. The service was prompt and honest and the cost was minimal. What a relief! Thanks so much. 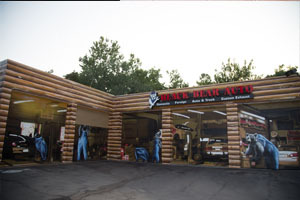 Black Bear Auto is an Outstanding repair facility. Barry takes excellent care of your car and stands behind all his work 100% . I brought my car in for front end problems and Barry had the problem solved quickly. Barry and his staff listen to the customer's complaints and ask for you to road test the car to find out what the problem is. They treat the customer with respect and honor. I can think of no where else to take my car. It is so hard these days to find and good mechanic. Barry is a certified mechanic and his staff is very dedicated to helping the customer and fixing the problem . Prices are always fair and as I said before, Barry stands behind all his work. I recommend Black Bear very highly. Stop in and see Barry. You will be impressed. I was frantic when Veron's Auto decided to retire, then I heard about Bears. They truly are a great company who's owner and staff are top notch. Door to door service and reasonable rates for the amount of work that they did to my car. (I hate taking my car to a dealer) So my experience was wonderful and i'll keep them doing work on my car. Thanks! I have a custom performance exhaust system that was on my truck when I bought it. After several years the muffler and tailpipe separated. I looked online to try to find a "good" exhaust place. I found Black Bear Auto which was rated quite well. I called and Mike was able to fit me in the very next day. My first impression was awe. 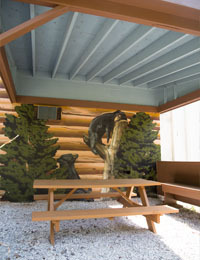 The building looks awesome with its mural painting, and the property was well kept. Inside the building was not like your regular garage. The office was very inviting and hospitable with various coffees, sodas, and water. It also had an area for customer to wait that included chairs and a large table if you needed to get some work done while away from school or the office. The garage was also well kept and maintained, It was easy to see there was a high level of professionalism and pride in this garage. Barry worked his tail off to find me a suitable muffler for my system. He was able to have my exhaust system repaired and sounding great that afternoon. The price was very fair and was what I would expect from a reputable garage. There were no surprised. All work was authorized before it was performed. My truck sounded great and was left in the same condition as when i dropped it off. No dirty hand prints or greasy foot marks. 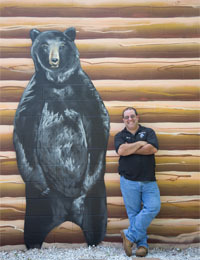 I would like to thank the staff at Black Bear for the work they did for me. I had a very good experience at Black Bear Auto and would recommend them to anyone who wants a fair,quality, and conscientious repair. This was the best car repair experience I've ever had! Excellent service! Completely fixed! I love this auto shop! I live in Massachusetts and work in CT. When I took my car to the Toyota Dealer in Massachusetts to get a small repair and a state inspection sticker, I was told my 4-Runner needed $3700 worth of work. I took my inspection sticker, drove right to Black Bear and showed Barry the list of "have to do's" from the Toyota place. Barry took the time to go thru the whole vehicle, make the necessary repairs ($1,000), and walk me thru step by step all of the "issues" that the Toyota place said I needed to do (that did not need to be done) and all of the parts that they were charging me double what Barry charged. I never worry when I take a vehicle to Black Bear that I am getting anything but the top service and the most fair price possible. You have to love a repair shop that tells you all the things you do not need done to your car, rather than the 3 page list of problems you get from the dealers. Run away from the dealership straight to Black Bear....and tell all your friends. I love bringing my car to black bear auto. I always trust Barry and the rest of the guys with my Infiniti. All around great people and a great shop! Wouldn't go anywhere else. I've been bringing my cars to Black Bear for 10+ years. Barry has always been upfront and honest with me regarding repairs and I've truly enjoyed doing business with him and his staff. He's helped me out in several emergency situations, given me rides to and from work and I appreciate his honesty and his willingness to help always! I've referred many family members and friends who have also become long time customers! Barry, thank you for finally being "an honest mechanic"! Great shop. Barry and his guys always do a great job. I know my car is in good hands at Black Bear. They do amazing work and cheap and in a timely manner. Since I'm from Florida and dont know anyone when my car broke down i found this place there service is awesome and they are so nice and welcoming i will definitely be going back for future service! ery reasonably priced, very knowledgeable, very courteous and helpful. They offer free refreshments in the waiting area, which was very clean and comfortable. After having some electrical problems with my car.......Got stuck in a bad situation, needed to get to my husband because his grandmother had just died but when I went out to start my car it almost didn't. I called these guys because I needed someone to help immediately and they went out of their way to make time for me despite not knowing what was wrong with my car or how long it would take them to fix it. By the time I got down to their parking lot my battery had completely died and my car was done. I wasn't going anywhere without their help. Barry, the owner, was so accommodating and so caring. They never charge me a diagnostic fee to figure out what was wrong with my car. Very simply ran outside immediately diagnosed my car and then got one of his mechanics right on it. I was in and out of there within a half an hour. He did not overcharge me in fact in my opinion he under charged me. The mechanics in that situation would have taken full advantage and charged as much as they possibly could have and taking advantage of every possible way. These people did not, they are good people, good mechanics and everyone there has a great big heart. I was able to get to my husband's side and console him with very little headache or worry once I pulled into their parking lot. Definitely got more than my money's worth. Thank you so much Barry and black bear Auto! Quick, quality, reasonable prices and refreshments in the waiting room. I can definitely say the slogan fits, and I also found my new mechanic!